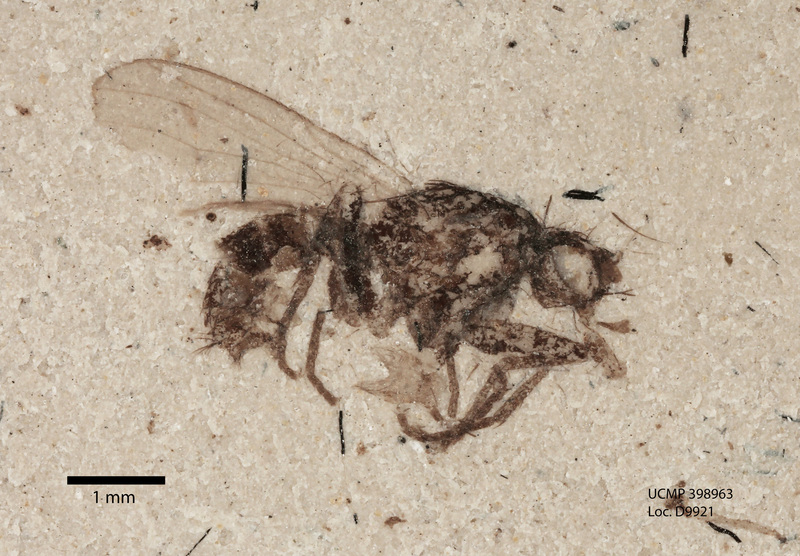 UCMP joins the ADBC Thematic Collections Network Fossil Insect Collaborative as a Partner to an Existing Network (PEN) along with seven institutions funded by the National Science Foundation to digitize and image the nation's largest collections of fossil insects. 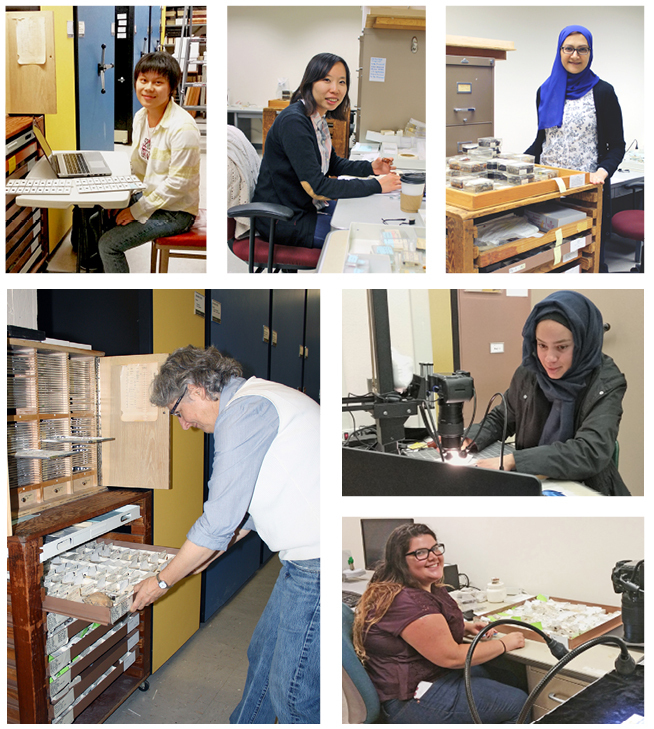 Diane Erwin spearheads the Berkeley Fossil Insect PEN (BFIP) team which was "buzzing" in the summer and throughout the fall semester databasing UCMP's insects in amber, many from Mexico given to UCMP by the Danish archaeologist Frans Blom. 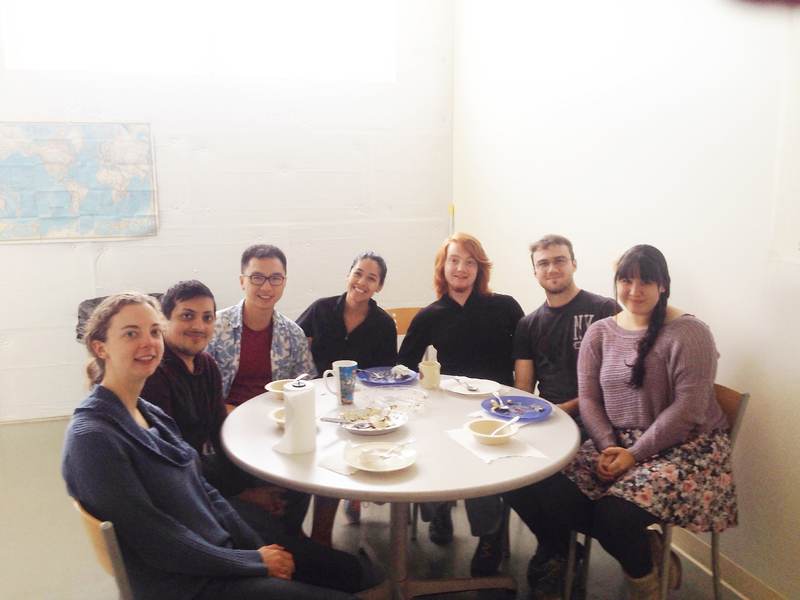 The BFIP team (see photos) also imaged insects preserved in mid-Miocene lake sediments from Stewart Valley, Nevada. Diane and Marwa's station was a popular stop with UCMP friends and visitors during the December holiday party. The former USGS Menlo Park invertebrate collection is now almost fully integrated into UCMP's invertebrate collection. Over the summer under the guidance of Erica Clites undergraduate students Patrick Garcialuna, Pranav Idnany, Lesly Ann Llarena, Holly Seyler, Louis Trevino and volunteer Laura Handy worked to rehouse, catalogue and label thousands of Pleistocene and Holocene fossils that were not fully curated. Currently, only 16 of the 147 original USGS cabinets still have fossils in them, and that number is swiftly dwindling. Volunteers Don Pecko and Kathy Zoehfeld, continued to help Erica curate fossils with locality information that were never assigned USGS locality numbers. The group added 150 of these new localities, with several hundred more to go. Graduate student Zixiang Zhang pioneered a new georeferenicing technique while transferring collection localities and geologic sections marked on USGS topographic maps into electronic format in our UCMP database. The georeferencing techniques developed over the summer will also be applied to the ~12,000 localities that need to be updated as part of the EPICC project (see below). Erica states "I'm pleased that we are able to capitalize on all of the hard work done by many UCMP students and volunteers on the USGS project I had the privilege of supervising. We continue to make UCMP's invertebrate fossils more accessible to the public and researchers through digital photographs and online specimen records on www.ucmp.berkeley.edu!" In the Fall of 2015, UCMP started work on a new four-year NSF funded project called EPICC: Eastern Pacific Invertebrate Communities of the Cenozoic, funded by the Advancing Digitization of Biological Collections (ADBC) program at the NSF. UCMP is the lead partner among the eight institutions mentioned in the Director's Letter to digitize 1.6 million invertebrate specimens from the eastern Pacific Ocean. The project will capture specimen photographs, as well as standard locality information. The data will be served on the web via the iDigBio portal (https:// www.idigbio.org/ portal). Part of EPICC's outreach plan involves the making of four virtual field experiences in collaboration with the Paleontological Research Institute. Viewers will be able to explore the outcrops, view the fauna, and see The summer 2015 Regatta crew takes a break from rehousing and curating fossils.